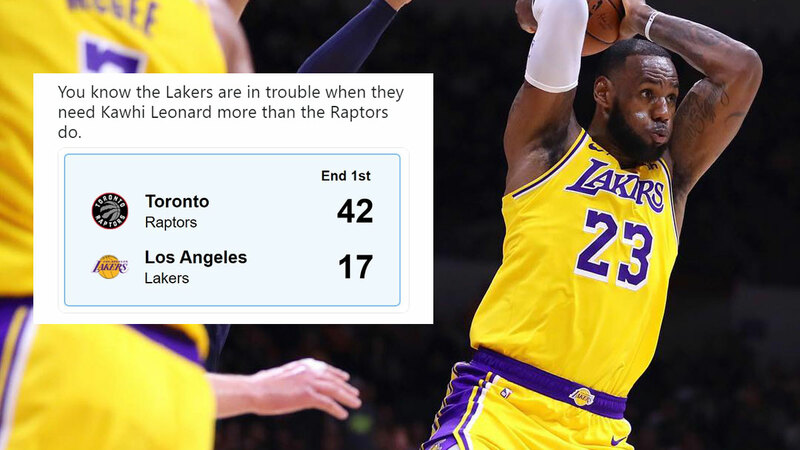 Serge Ibaka—not even the entire Toronto Raptors team—just outclassed the Los Angeles Lakers in the first 12 minutes of their game on Monday. The less-heralded and non-MVP member of the 2012 NBA Finals runner-ups went perfect from the field (8-of-8) for 20 points in only nine minutes, as Toronto (8-1) dealt the LeBron James-led Lakers (4-5) their worst point differential (42-17) in a first quarter in the shot-clock era (since 1954-55). What made the Raptors' feat more impressive was the fact that they did this without leading scorer Kawhi Leonard (26.1 ppg), who "jammed" his foot during his last outing. According to ESPN Stats & Info, Los Angeles hadn't trailed by 20+ points in each of their first nine games this season. LeBron and co. were actually much better in the second quarter, outscoring Toronto 32-29 but still enter halftime down 71-49 and are yet to make a three-pointer (0-6).